New Jersey Pesticide Control Regulations [N.J.A.C. 7:30] specify pesticide notification and reporting requirements. When regulations require written records to be kept on file and/or submitted to the NJDEP, all required elements must be provided. However, in most cases, the regulations do not prescribe a particular format for this information. If you choose, you may devise your own record keeping system as long as it is in compliance with the applicable regulations. As a service, we have developed formatted templates for: pesticide application records; storage inventory submittals; Consumer Information Notice; and spill reporting. The forms below are an option and are not required to be used. Consult the New Jersey pesticide control regulations online or contact the NJDEP for more specifics. In New Jersey, all licensed pesticide applicators are required to maintain application records of any pesticide applied, whether it is a restricted or general use pesticide. Both Private and Commercial Pesticide Applicators must maintain pesticide application records for themselves, as well as anyone performing application(s) under their direct supervision. This includes “handlers”; licensed Commercial Operators; or any Commercial Applicator or Operator receiving on-the-job training. It is extremely important that licensed pesticide applicators maintain accurate records of each pesticide application made. The application record templates below incorporate the three types of required records into a single form. These forms have been reviewed by the NJDEP to be compliant with the 2008 revised regulation changes in required records. Commercial applicators: 3 years; with the exception of termiticide applications, which be maintained on file for a minimum of 5 years. The NJDEP released a policy clarification on pesticide record keeping (PDF) in October of 2002, which is posted for your convenience. Contact the NJDEP for further clarification. 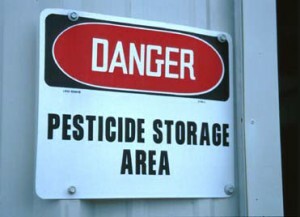 In New Jersey, all licensed pesticide applicators who store pesticides are required per N.J.A.C. 7:30-9.5 to maintain a list of the pesticides stored or likely to be stored during the license year. A storage inventory should be kept separate from the actual storage area. See below for a template form that meets the requirements for a single storage location address. The purpose of the inventory is to provide local fire departments with an accurate description of things stored by location in case of fire or other emergency. We suggest filling out a form per storage address of your establishment. You may also devise a form that suits your needs as long as it meets the requirements of N.J.A.C. 7:30-9.5. All licensed pesticide applicators who store pesticides are required by law to send a copy of their storage inventor(ies) with an explanatory cover letter to the local fire company along with a description and/or diagram of the actual location of each storage area. Specifically, NJDEP regulations provide; “The cover letter shall explain that this list has been sent pursuant to N.J.A.C. 7:30-9.5(b).4”. See below for a template submittal letter that meets the requirements. Submittal to the fire department is required annually by May 1st of each year. (This does not pertain to pesticides stored for personal use, or to those storing pesticides at loading or application areas for less than 7 days.) Applicators must keep the cover letter on file for a minimum of three years and should have it available for NJDEP upon request. Outside a structure – only if more than 1 pound active ingredient. Inside a structure – only if more than 1 pound active of dry pesticides; or 1 gallon of liquid (pesticide &/or diluent). Indoor spill of termiticide – only if more than 50 in² organochlorine termiticide contamination at one injection point; or greater than 1 yd² aggregate contaminated by organochlorine termiticide on/at interior wall base; and/or when heating duct/system is contaminated. The licensed dealer, dealer business, commercial pesticide operator, applicator or applicator business, shall immediately notify the Department at 1-877-927-6337 of any reportable pesticide spill occurring under such person’s direct supervision and/or direct observation. Within 10 days of the spill, a written report must be submitted to the NJDEP at Pesticide Control Program, P.O. Box 411, Trenton, NJ 08625-0411. NJDEP regulations require specific information (above) to be reported, but do not require a format for a written spill report. As a public service, Rutgers has developed a template “Spill Report Card” (PDF) (Word) that outlines the minimum requirements of N.J.A.C.7:30-9.17. We strongly suggest that these be used as a training tool. On one side, the Report Card includes the N.J.A.C. 7:30-1.2 definition of a pesticide spill; plus a bulleted list of the thresholds/circumstance to determine if a spill is reportable; who is responsible to report; and when and how to report a spill. On the back, the Report Card has blanks to write each of the elements that must be reported (or use as a script) to call in. Some of the information can be filled in advance, and kept in service vehicles, storage areas, etc. That Report Card can then be used as the hard-copy follow-up required to be sent to the NJDEP. If additional corrective action was taken, it could be added prior to mailing to the NJDEP. Administrative note: It can be printed on 8 ½ ” x 11″ card stock paper; and printed double-sided on a single page; and then be cut in half along the dotted line, giving two separate copies per print. Contact the Extension Pesticide Safety Education Program Coordinator at 848-932-9802 for assistance in how to use or print the Report Card. Choose the form you need according to the intended purpose listed below. See excerpt of NJAC 7:30- 8.8 Records for exact elements required by the 2008 revised regulations. This sample record meets all of these elements. You may use your own form as long as all regulation-required elements are recorded. Commercial Applicator Record Packet Source: NJDEP Commercial Applicators Can be used for any commercial application, including landscaping Sees excerpt of NJAC 7:30-6.8 Records for exact elements required by the 2008 revised regulations. . Note: Per NJDEP’s 2008 regulation revision, our example cover letter has been revised to add the citation of the exact location of the storage area on your property. You may indicate the exact location by either written description or diagram.